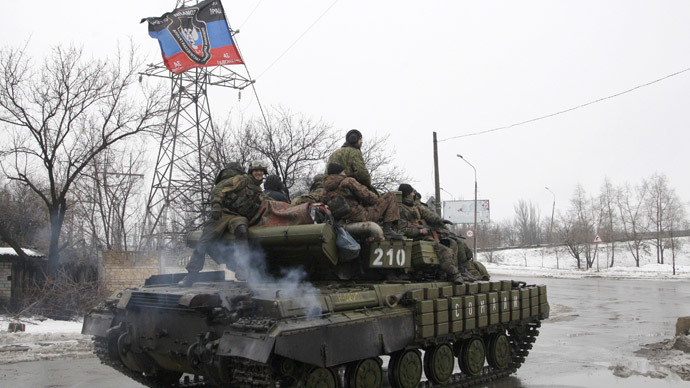 The eastern Ukrainian militias have stopped all military action in accordance with the Minsk peace deal. They will suppress any provocations that may be organized by Kiev forces, said Aleksandr Zakharchenko, head of Donetsk People’s Republic. Meanwhile, Defense Ministry spokesman of Donetsk People’s Republic, Eduard Basurin, has ordered that all eastern Ukrainian militia units halt fighting “on the entire line of contact,” RIA Novosti reports. A similar statement has come out of the self-proclaimed Lugansk People's Republic, saying that local militia are to stop all combat actions at midnight. RT’s correspondent Murad Gazdiev reported from Donetsk that it felt “eerily calm” after the intense shelling gradually ceased after midnight. Earlier, leaders of the restive Ukrainian republics said their regions have ratified the peace deal. The militias will stop all military action outside the territory of the Donetsk People’s Republic, Zakharchenko said. However, he said that the self-defense forces will reply to any provocative actions by the Kiev troops, including assaults and precision fire. The DPR leader also said that rebels won’t release a large group of Ukrainian troops, who have been entrapped near the village of Debaltsevo since early February. “Their every attempt to break out will be suppressed,” Zakharchenko is cited by RIA-Novosti news agency. Earlier, Basurin said that the Ukrainian troops near Debaltsevo won’t be shelled, but won’t be released as well, with surrender being the only option. Zakharchenko has put his signature under a decree, which foresees the beginning of the ceasefire at 01:00 AM local time on Sunday - midnight for Kiev and 2200 GMT. Meanwhile, Ukrainian president Petro Poroshenko has once again warned that Ukraine if the Minsk agreements fail, “martial law will be implemented not only in Donetsk and Lugansk, but in the whole country”. Moscow has expressed hopes Kiev and the rebels, as well as all the sides, which supported the Minsk peace deal, including France and Germany, “will do everything for the signed agreements to be scrupulously implemented,” the Russian Foreign Ministry said. "Ukraine's official representatives...as well as those of several Western countries, the US in particular, have essentially expressed solidarity with the opinion of radical nationalists in the Verkhovna Rada (Ukrainian parliament) and have began distorting the contents of the Minsk agreements," the ministry said. On Saturday, Poroshenko spoke to German Chancellor Angela Merkel and French President Francois Hollande on the phone, with the three heads of state stressing that all sides must fulfill the obligations they’ve taken according to Minsk agreements, first of all, those concerning the ceasefire. The Ukrainian president also had a telephone conversation with US president Barack Obama, during which the two leaders “agreed on the further coordination of efforts in the event of an escalation” in Ukraine's southeast. Poroshenko and Obama “discussed the situation in Donbass and expressed concerns about the situation in Debaltsevo,” according to the Ukrainian president’s website. Lavrov also emphasized that the Minsk peace deal “also includes obligations by Kiev to remove the financial and economic blockade of the [Ukrainian] southeast; to provide an amnesty; to stage a constitutional reform by the end of the year and adopt legislation on the special status of Donbass," Russia’s Foreign Ministry said on its Facebook page. The contact group, which includes representatives from the Donetsk and Lugansk regions, held video consultations on Saturday, the Organization for Security and Co-operation in Europe (OSCE) said. According to the OSCE, all parties agreed to take necessary measures to establish the agreed truce and de-escalation of the conflict, including in the areas of Debaltsevo and Mariupol. The contact group will continue holding consultations on a regular basis to ensure the implementation of the Minsk agreements, a statement from the watchdog added. A separate declaration supporting the deal was agreed upon by the so-called “Normandy Four” leaders – French President Francois Hollande, German Chancellor Angela Merkel, Russian President Vladimir Putin and Ukrainian President Petro Poroshenko, who also gathered in Belarusian capital. In accordance with the deal, on Saturday the eastern Ukrainian republics also proposed amendments to the constitution. One of the key demands is to grant certain regions the right to define and form the structure of local governments themselves, Denis Pushilin, DPR representative at the Minsk talks, said. The rebels also want the official status for the Russian language and other minority languages, spoken in Ukraine’s central regions, he said. Another proposed amendment foresees the decentralization of fiscal and tax systems, “up to the possibility of creating in free economic zones and other special economic regimes on certain territories," Pushilin is cited by TASS news agency. 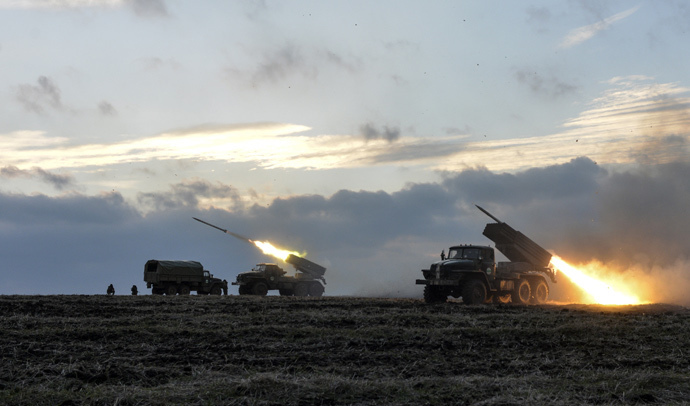 While the Minsk deal is hoped to secure an end to the bloody and devastating internal conflict that has taken the lives of over 5,300 people in the UN’s estimates since last April, shelling in Donetsk was reported throughout the whole of Saturday.